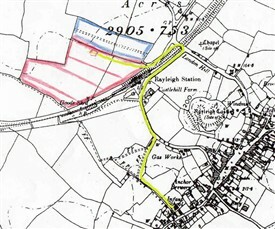 Peter was born in 1930 and grew up in an area behind Rayleigh Station marked out in plots to be developed. The areas in red on the map were for housing and those in blue were allotments. Peter went to Love Lane school at the bottom of the map by the yellow route crossing cowfields. He was part of a large family of two girls, Joan and Kathleen, a brother Cyril and a younger brother David. The house, called Crofton, was one of only a few which were actually built when Peter was a lad. There was running cold water but no gas or electricity and hot water had to be boiled in a copper. The tin bath was brought in from the garden once a week, placed in front of the fire and the family took turns to use it. Food was cooked on a coal fire with an oven at the side and the house was lit with paraffin lamps and candles. Later on gas and electricity were installed; Peter's mother even had a gas iron and gas refrigerator. Peter says that really changed their lives, even though they still went to bed by candlelight. Mr Taylor worked in London and travelled there by train everyday except Sundays. There was not much money but he grew vegetables on his allotments to feed the growing family. Their mother kept goats for milk and a variety of poultry for food which were allowed to run loose on the undeveloped plotland. Chicks were bought 300 at a time for a penny each from Rayleigh market. They were carefully reared and after about eight weeks were let loose. Peter left school at the age of 14. He was dyslexic, a condition which was not recognised in those days. He had difficulty with school work and had rarely attended for the last two years. However, Peter was good with animals and could do anything with his hands. Many people kept livestock during the war in order to supplement their diets. 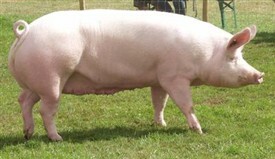 If they had enough space some people kept a pig but it was almost impossible to buy pig food. Being of an enterprising nature, young Peter got hold of a donkey and cart and made a contract with Love Lane school to collect all the leftovers from the school dinners every day. He then sold and distributed the waste as pig food. This was his first business. After a while Peter bought himself a piglet. He reared it and it had young. 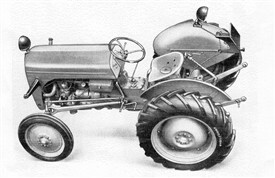 As well as keeping pigs Peter worked on farms locally driving tractors from the age of 12. Later, a neighbour started a farmwork contract business; Peter worked for him ploughing in winter and cutting and bringing in hay and silage in summer. He bought a big steam boiler to cook and sterilize the pig food before he left for work at six each morning. After the war there was a huge demand for housing and the some of the plotlands were developed for council houses. Peter's sister and her family came back to live at Crofton so his parents bought a little bungalow nearby. Peter still had to live at home to take care of the pigs. Still only in his teens, he saw another opportunity to make money. 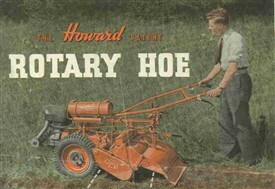 He spent £150 on a 12 hp Howard Gem rotary hoe which he took round the area offering to dig gardens and allotments. One Sunday he came home with £100 in cash earned at the new Broadlands estate at Hockley. Life wasn't all work for the young man; most Saturdays he would go on the “City bus” to the cinema in Southend and often on to the Glider Room roller skating rink. One week a young lady sat next to him in the cinema, they chatted in the interval and when the film ended they walked to the bus stop together. 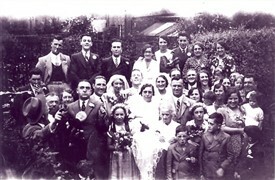 Wendy came from a large family who lived in Southchurch. She had just matriculated from college at Southend and was about to start her first job. When Peter's bus came, Wendy kissed him: she was nearly 16 and he was 19. This was the start of their romance. This page was added by Sue Horncastle on 30/07/2016.